Summary: Though US GDP jumped to 4.1% for the second quarter of 2018, our Financial Sense Leading Economic Index suggests slightly lower growth in the second half. Furthermore, inflationary pressures are likely to continue building until at least late-2019 with the Fed still relatively loose at present. This will likely change, and present a greater headwind, in 2019. 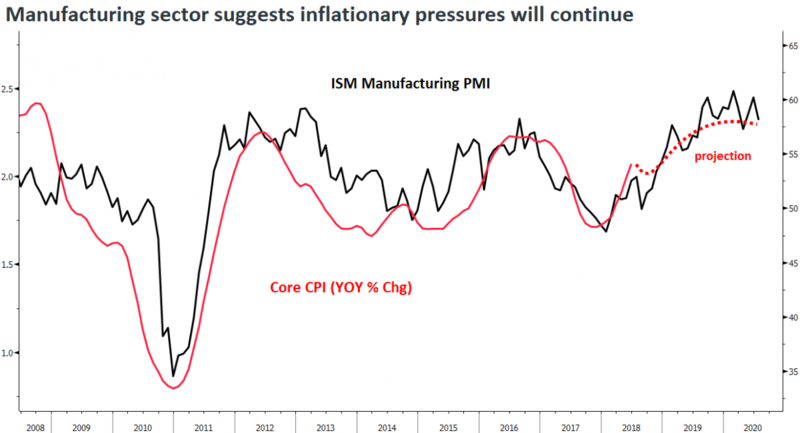 If we look at the ISM manufacturing purchasing managers index, which leads inflation by around 2 years, it suggests that inflationary pressures should continue to build in the US economy and not peak out until at least late 2019, early 2020. Is the Fed Ready to Break the Markets? As we’ve noted many times before, the Federal Reserve typically raises rates to combat rising inflationary pressures until something breaks, which ultimately means recession. To gauge this risk, Chris Puplava, CIO of Financial Sense Wealth Management, has developed what we refer to as a Fed Funds Risk Neutral Index, which looks at the Fed funds rate relative to the strength of the US economy and present levels of inflation. Right now, it is signaling that the Fed is not yet in danger of breaking the economy or the markets and that monetary policy is still relatively loose. 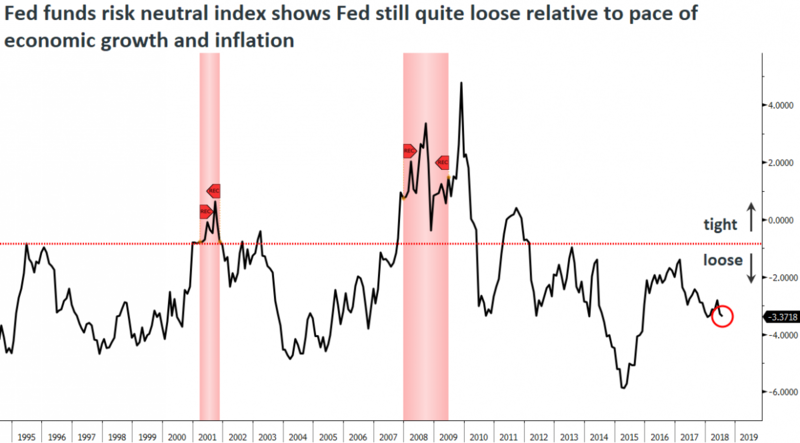 However, if we do see inflation continue to pick up and the Fed tighten in the face of a cooling economy, the index should signal that we are closer to the red zone for recession. Though US GDP jumped to 4.1% for the second quarter of 2018, our Financial Sense Leading Economic Index (in blue) indicates that we should expect slightly lower growth in the second half. We show it plotted next to the Conference Board's US Leading Index (in red) below. As it stands, the Financial Sense LEI indicates the economy will still continue to grow and is far from any recessionary warning levels. However, that said, growth rates could be peaking, especially if our LEI continues to decline. The level of stress in the financial system can be measured in a variety of ways and numerous Federal Reserve regional banks have developed their own indicators for doing just this. We have aggregated a number of them together into a single composite, as shown below. As we've indicated on the chart, financial stress levels moved into the red zone in 1998 and 2007. Currently, financial stress levels are very low and not yet warning of a market top. One thing we are watching is whether 2017 marked the peak with further stresses ahead of us, reflected by yield spreads, liquidity measures, volatility, and other metrics included in this indicator. 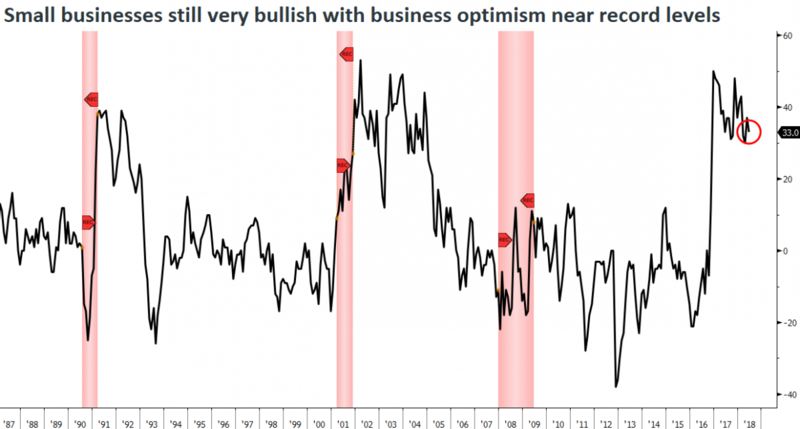 We also look at NFIB's small business outlook for general business conditions since small businesses are the main engine for economic growth in the United States. This is probably the most positive indicator we see currently when it comes to the economic outlook. What's interesting on the data above is that the present outlook by small businesses coincides with levels typially seen during the early stages of an economic cycle. 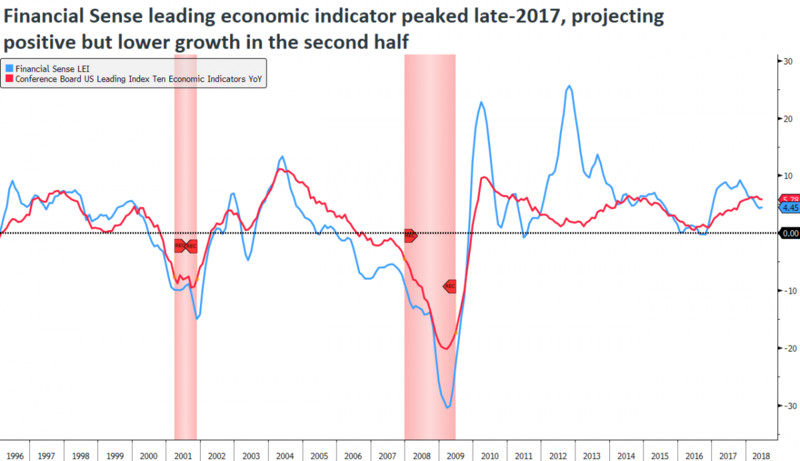 Time will tell if this indicator is as good as it has been in the past but, as of now, it’s a very positive sign for the economy. Temp employment acts as an early indicator for the overall US jobs market because firms are more likely to add or shed jobs at the margin, as conditions either improve or deteriorate, before laying off their main workforce. Looking at the most recent data, temp employment agrees with our FS LEI by signaling incremental signs of softening. 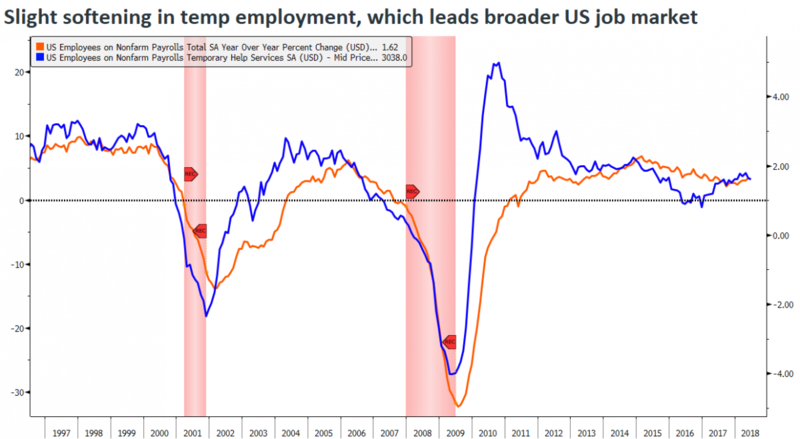 There is a high correlation between temporary employment (in blue) and nonfarm payrolls (in orange), and if temp employment continues to soften, that will provide another signal that things are indeed slowing and peak growth is behind us. Jobless claims continue to fall signaling that the US job market is still healthy. This is an important, real-time (weekly) leading indicator that picks up prior to recessions, in some cases years before an actual recession materializes. 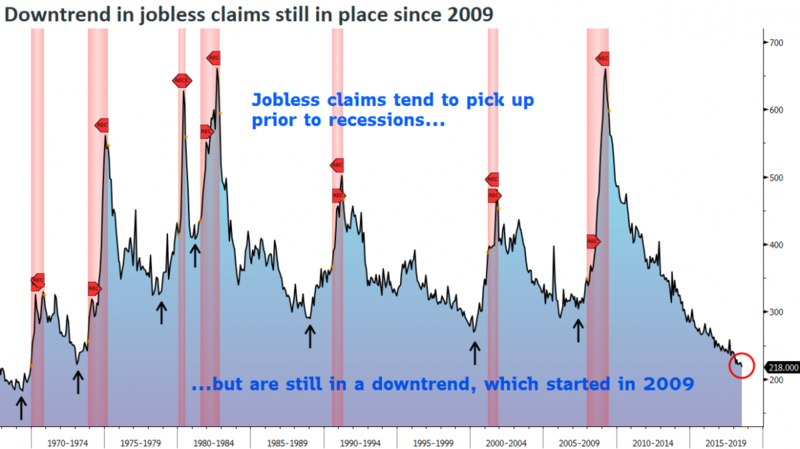 Right now jobless claims are continuing to fall and the indicator isn’t yet raising a red flag on the US economy. Overall, the probability of an imminent recession in the U.S. is very low and the economic outlook is still favorable for the rest of 2018. After that, though, conditions are expected to weaken somewhat, and we’ll be watching what the Fed does to see if they’re close to killing the economy by responding to increasing inflationary pressures. 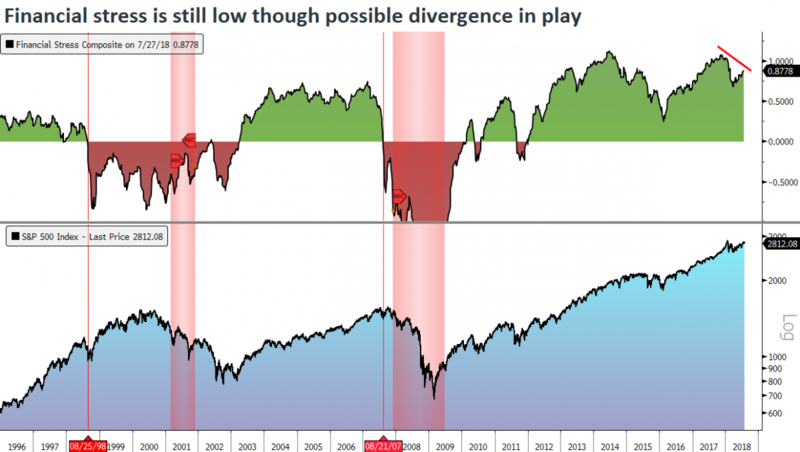 If we’re going to see a mild recession materialize in the late-2019 or 2020 timeframe, these indicators will likely give us the heads up to move away from stocks and increase our cash positions.